Last night at the San Diego Comic-Con, Marvel Studios President Kevin Feige took the stage in Hall H for a panel to showcase the ever-expanding Marvel Cinematic Universe. Photos from the Marvel Studios panel are now available in the gallery below! For director Taika Waititi’s Thor: Ragnarok, both the new trailer and poster were released, which you can view by clicking here. Don’t miss our interviews with Waititi, Tessa Thompson and Karl Urban here as well. Thor: Ragnarok will feature the return of Chris Hemsworth as the God of Thunder himself, with Tom Hiddleston as Loki, Mark Ruffalo as the Hulk, Idris Elba as Heimdall and Sir Anthony Hopkins again portraying Odin. 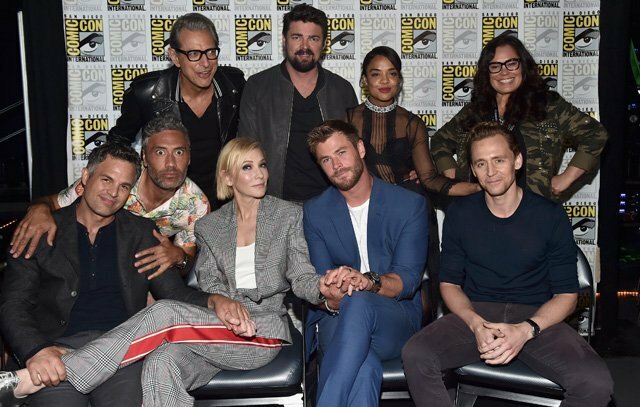 The film also stars Cate Blanchett as the death-obsessed Hela, Tessa Thompson as hero Valkyrie, Jeff Goldblum as the eccentric Grandmaster and Karl Urban as Skurge. As teased at the end of his solo film, Benedict Cumberbatch’s Doctor Strange will also make an appearance. Thor: Ragnarok will smash its way into theaters on November 3, 2017. The new poster for Black Panther debuted at the panel and can be viewed here. We also talked to director Ryan Coogler, Letitia Wright and Winston Duke, and you can see what they had to say here. Black Panther, opening in theaters on February 16, 2018, follows T’Challa (Chadwick Boseman) who, after the death of his father, the King of Wakanda, returns home to the isolated, technologically-advanced African nation to succeed the throne and take his rightful place as king. But when a powerful old enemy reappears, T’Challa’s mettle as king—and Black Panther—is tested when he is drawn into a formidable conflict that puts the fate of Wakanda and the entire world at risk. Faced with treachery and danger, the young king must rally his allies and release the full power of Black Panther to defeat his foes and secure the safety of his people and their way of life. Black Panther is directed by Ryan Coogler and also stars Michael B. Jordan as Erik Killmonger, Lupita Nyong’o as Nakia, Danai Gurira as Okoye, Daniel Kaluuya as W’Kabi, Letitia Wright as Shuri, Winston Duke as M’Baku, Angela Bassett as Ramonda and Forest Whitaker as Zuri. Over 50 More Comic-Con 2017 PhotosAnt-Man and the Wasp Comic-Con Poster Revealed!